Becky Rich lives in Preston. She joined DanceSyndrome in 2014 after her dad had heard about the charity through a leaflet. Becky loves DanceSyndrome! She has been dancing since a young age and has always wanted to teach dance, so the opportunities that DanceSyndrome has given her make Becky feel happy! Becky completed DanceSyndrome’s unique training course, Dance by Example, which enabled her to learn the skills required to teach a dance session. 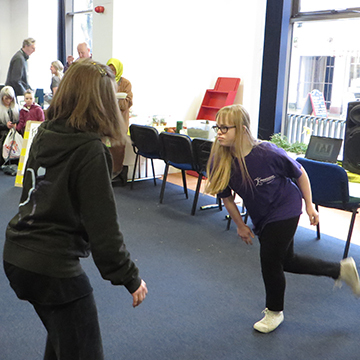 When Becky first started attending DanceSyndrome she was nervous about joining in but since taking part in the workshops and the Dance by Example course her confidence has grown enormously. DanceSyndrome has given Becky the confidence to lead her own dance sessions at a day centre, separate from DanceSyndrome. Becky thinks that this increase in confidence is due to being surrounded by friends that are very supportive at DanceSyndrome. She also feels more confident to talk to customers at the museum of Lancashire where she works. Becky’s family have commented saying how much her dancing has improved. She wants to continue to dance as it makes her feel happy and it keeps things normal within her life. Becky thoroughly enjoys dancing and her favourite part of her work with DanceSyndrome is being able to perform to the public because she really enjoys raising awareness and sharing the message that people with disabilities should be accepted. Through DanceSyndrome, Becky has learnt the importance of listening to the opinions of others and what effective teamwork can achieve. She feels a lot healthier since coming to DanceSyndrome; it has helped her lose weight, she feels stronger, she now eats healthier when at home and also uses her spare time to get more exercise by going dog walking. Becky wants to encourage other people with disabilities to dance so they can feel free and realise that things aren’t that bad in life. In 2018 she took on the role of DanceSyndrome Spokesperson and Ambassador and travels around the country sharing the charity’s “ability, not disability” ethos. Becky’s hard work and dedication to her volunteering role has been recognised through a number of awards. In November 2016, Lancashire County Council awarded her the “Volunteer of the Year” award at their annual Pride Awards. In 2018 she was included on the national Learning Disability and Autism Leaders List and was also awarded the Lesley Finley Community Award by Disability Equality (NW) in recognition of the work she has done to help other people with a learning disability in the North West. Becky is a truly inspirational lady, making a real difference in her local community and beyond!